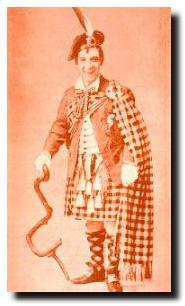 Scotland's image in the world today owes much to the caricature presented by Harry Lauder's stage performances, particularly in England, Canada and the 22 tours in the United States. His extravagant highland dress, glengarry at a jaunty angle, pawky humour, "ultra-thrifty" attitudes and sentimental songs endeared him to many audiences. Born in Portobello he worked in a flax mill and a coal mine before winning a singing contest which set him off on his new career which saw him at Carnegie Hall - and golfing with presidents. Songs such as "I Love a Lassie" and "Roamin' in the Gloamin" were inspired by love for his wife and "Keep Right on to the End of the Road" was written after his son was killed in action in the First World War. While some deprecate the false images he portrayed, Harry Lauder summed up his philosophy as "Aye, I'm tellin' ye, happiness is one of the few things in this world that doubles every time you share it with someone else."